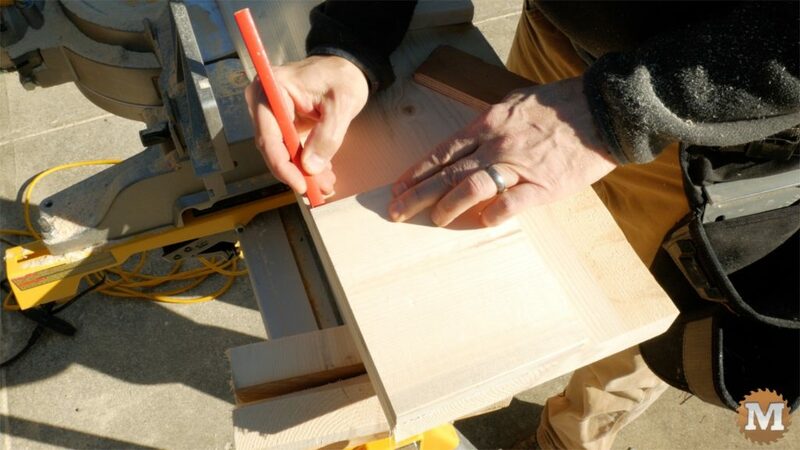 Build your own Firewood Cutting Jig! 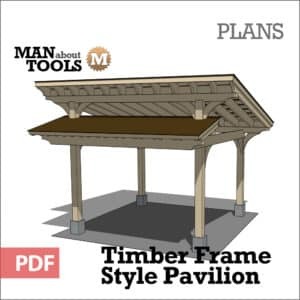 See the Video on YouTube and download the Plans. Built a Firewood Cutting Jig! 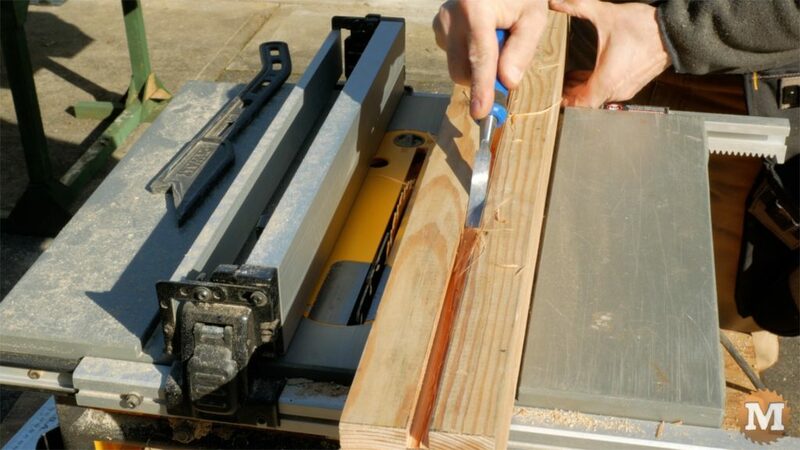 This Firewood Cutting Jig is a fast and easy way to cut firewood from small stripped branches or sawmill slab wood. 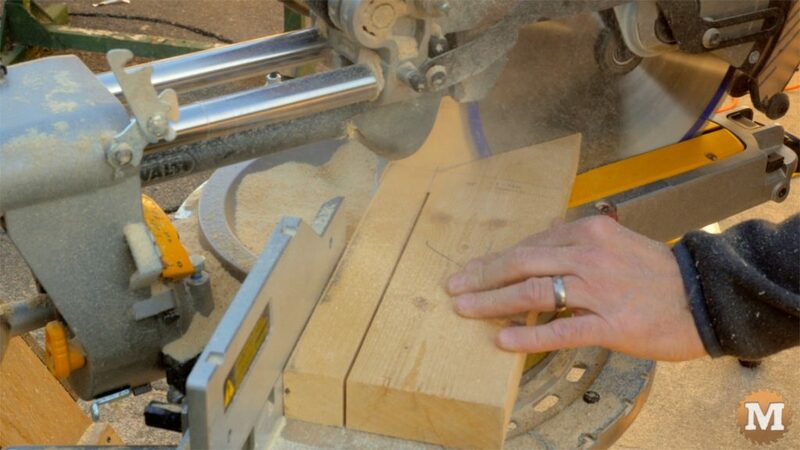 Can be used as a processor of slab-wood sawmill off-cuts too. 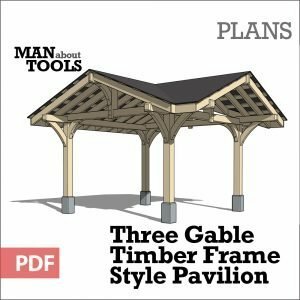 When we purchased this home and property there was a load of old tools and assorted building materials that we asked to be included in the sale. The house, workshops, and out buildings were built sometime in the 1950’s by the owner, an Austrian carpenter who settled here after World War II. From what we have heard, he cleared this land by hand, and he was a meticulous craftsman. His workmanship is evident in the quality of the fit and finishing of the house he built. In our back field I came across an old Firewood Cutting Jig and I have used it a few times to cut wood stove length material to heat the house. 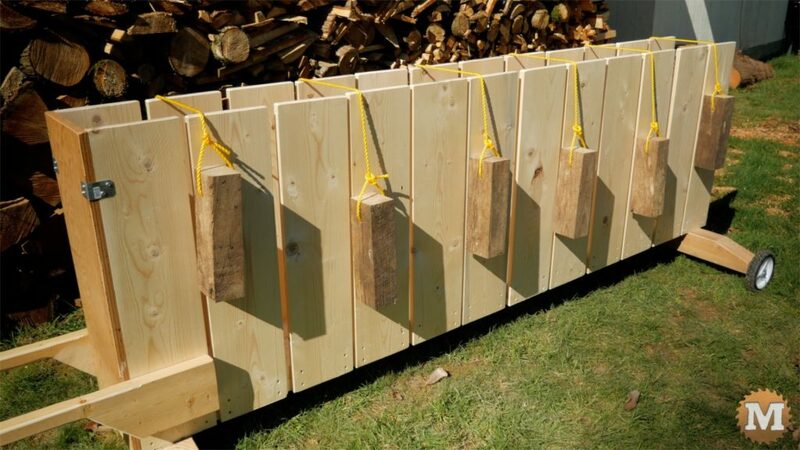 It is a great firewood processor, of a sort. Over the years, this jig has suffered from the weather here on the west coast and the slots can get cut away after each use. 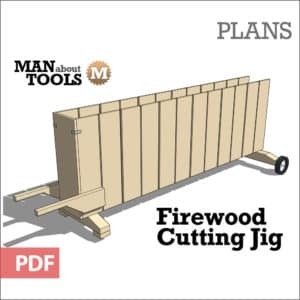 I thought it would be a good time to build a new firewood cutting jig based on this design. 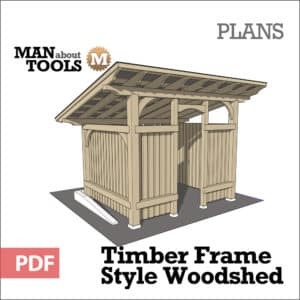 It’s simple, portable, and very efficient at turning long branches or slab wood off-cuts from a sawmill into firewood. You simply load it up, drop the roped weights over the stack, and run your chainsaw down the slots. 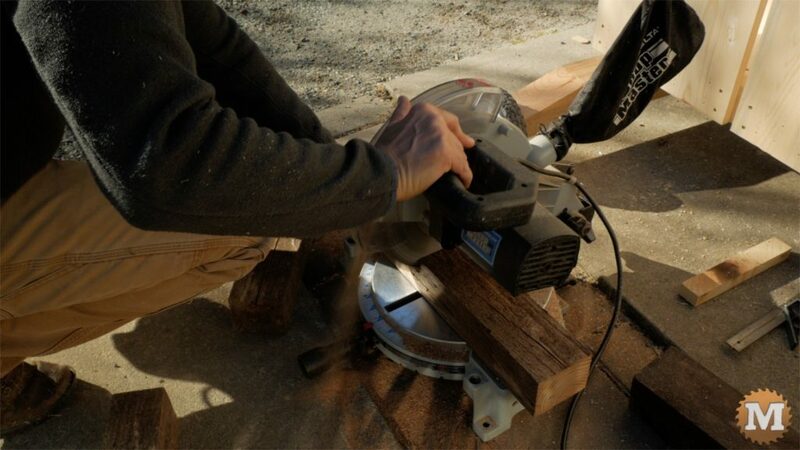 This is a good option to hold wood while chainsawing. I find it one of the best ways to cut branches for firewood. And, it’s a portable chainsaw wood cutting rack. 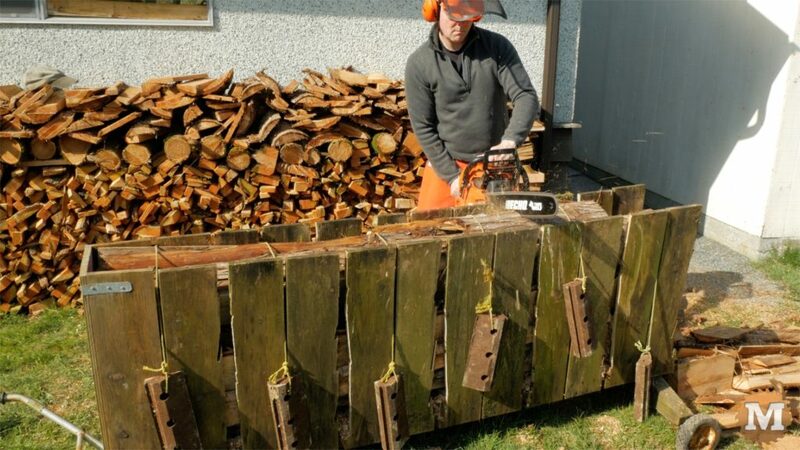 An excellent log holder for cutting firewood. 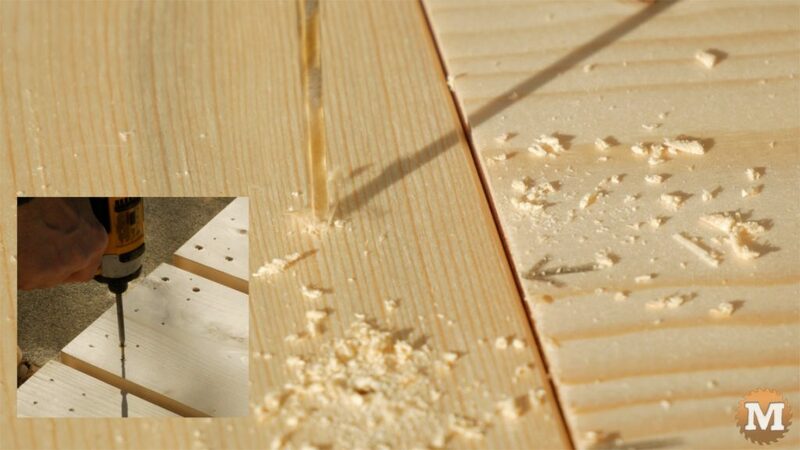 The firewood jig is made from these main components: A front and rear support made from 4×4 lumber. A base made from a pair of 2×10’s. Sides made from 1×8’s. Handles made from a 2×6. And weights attached with ropes made from salvaged materials. 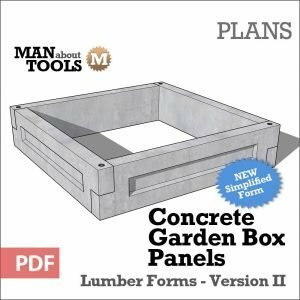 Start with the two bases made from a 4×4. 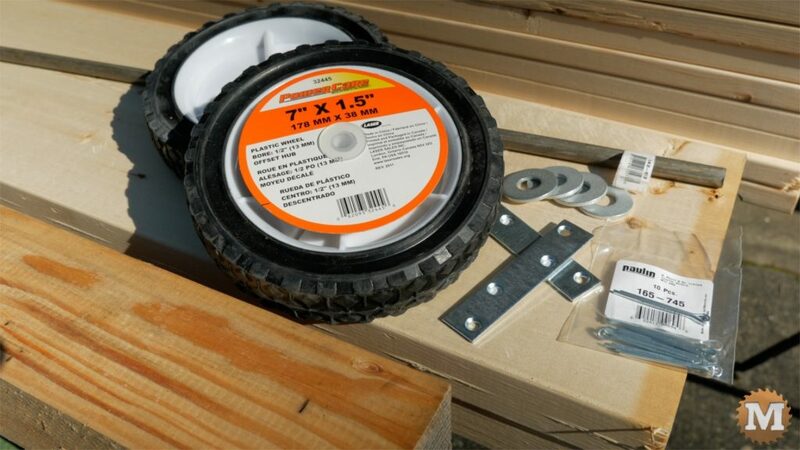 For the rear base I’ll need lawnmower wheels, a half inch steel axle rod, some galvanized washers, small mending plates, and cotter pins. 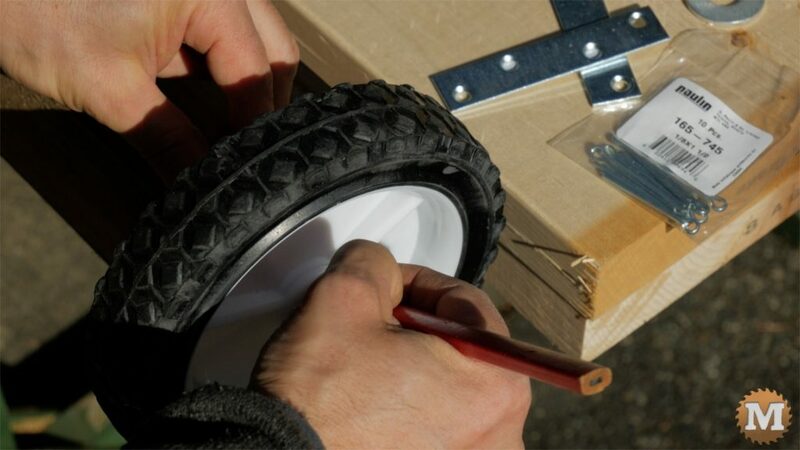 With one wheel on the axle, line up the edge of the tire to the end of the rod. 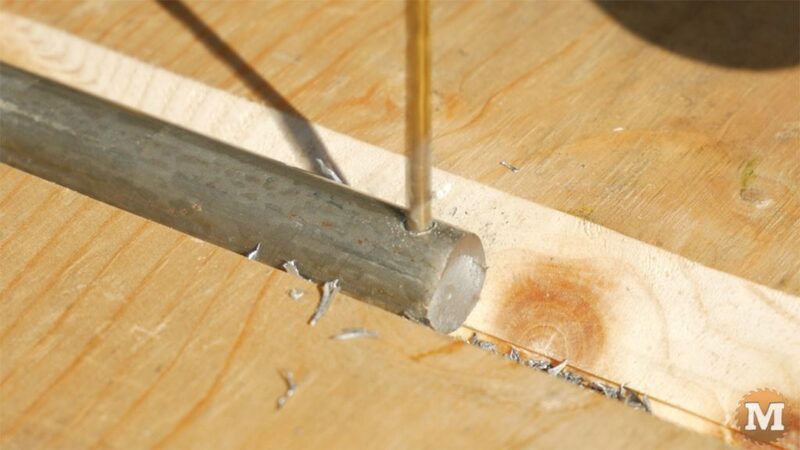 Make a pencil mark for the cotter pin hole. Repeat on the other end. Cut a V groove into a scrap piece of lumber to hold the round axle rod for the next few operations. 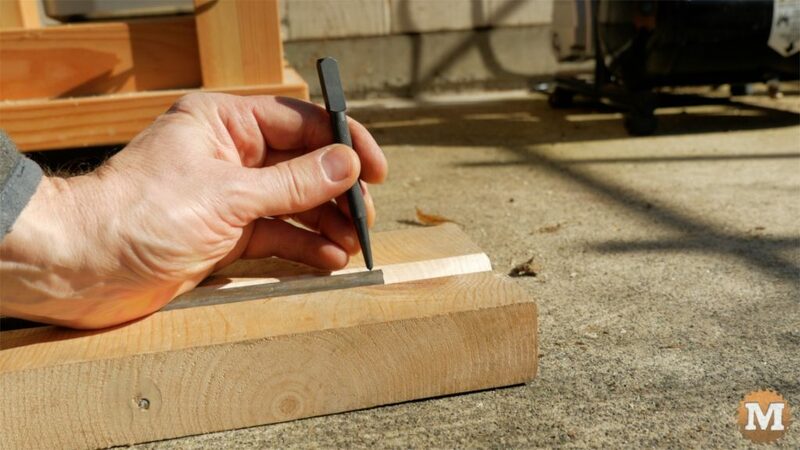 Use a center punch to create a small divot in the steel rod to help guide the drill bit. 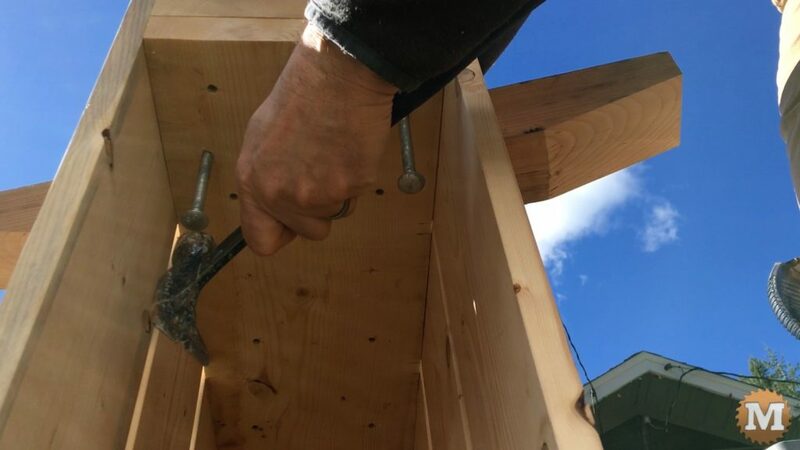 Use a hardened concrete nail if you don’t have a punch. 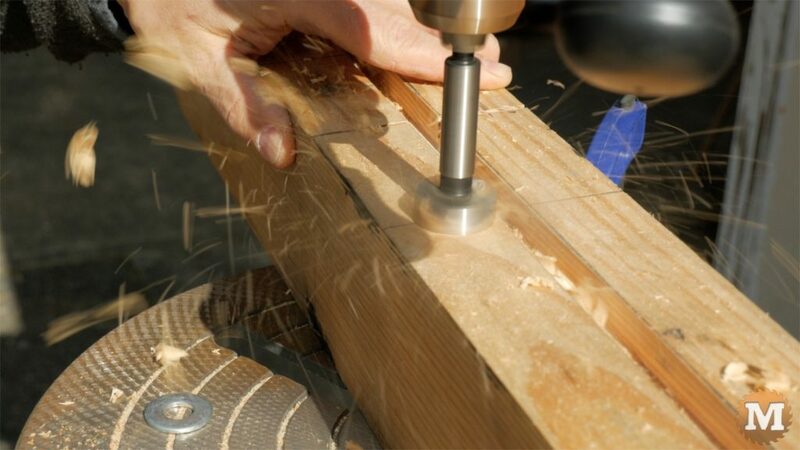 Drill a hole in the axle with a 1/8″ metal drill bit. Use a file to smooth down any burrs. 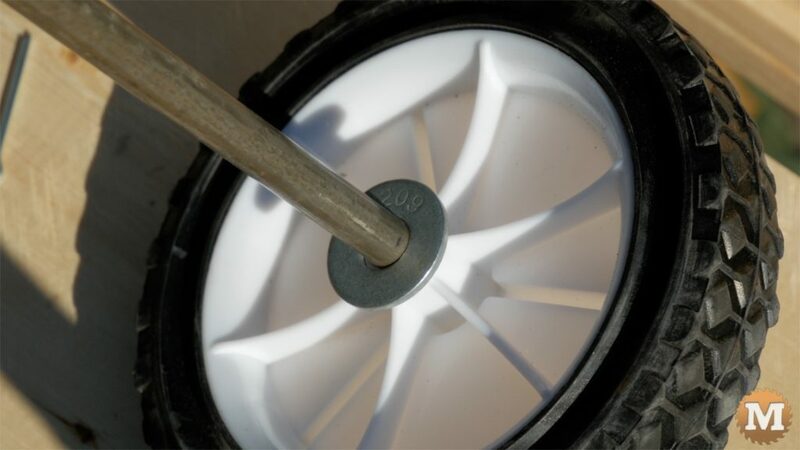 Slide a washer on the axle, the wheel, the opposing washer, and slide a cotter pin into the hole. 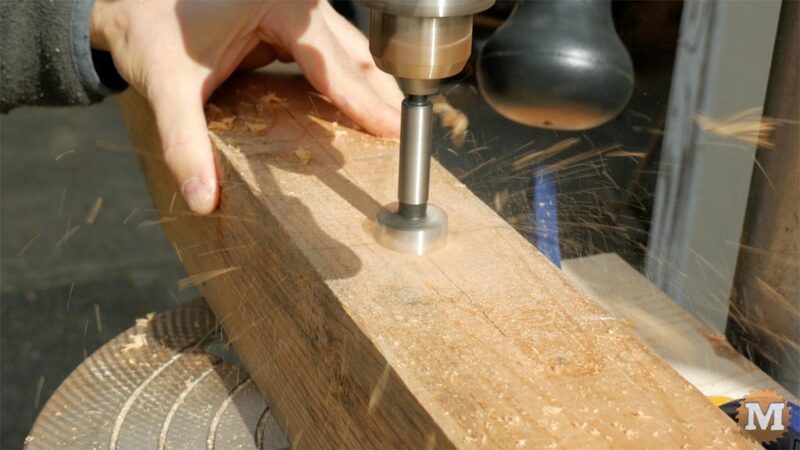 Mark the locations for the inner cotter pin holes, then center punch, drill, and file away any burrs. Assemble the wheels onto the axle but don’t bend over the cotter pins just yet. 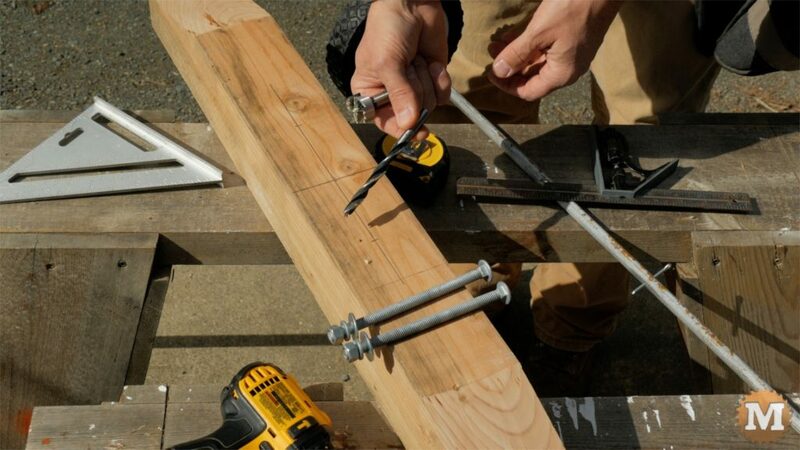 Measure the distance between the two inner cotter pins, subtract half an inch, then transfer that measurement to a 4×4. Cut this rear support to that length. Measure the front support according to the plans, and cut that as well. 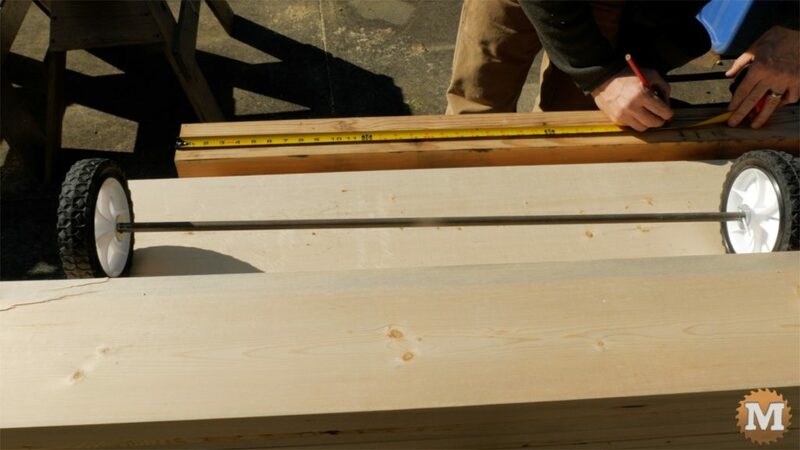 On the rear support measure and layout a groove to accept the axle rod. On the ends I marked the depth of this slot just shy the diameter of the rod. You want the axle to sit slightly high by about a sixteenth of an inch. 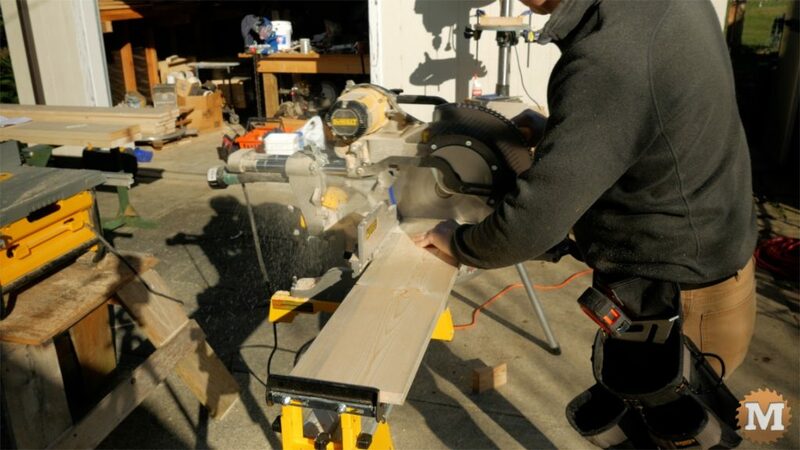 Set the table saw fence and run the rear support through the saw a few times. 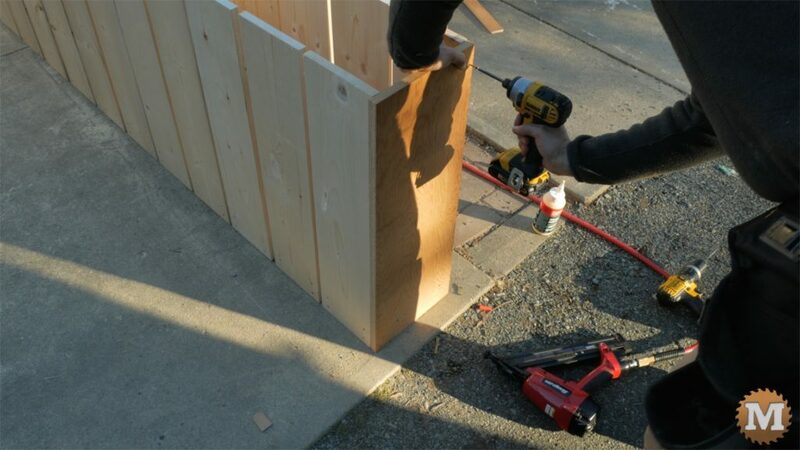 Adjusting the fence a blade width or so each time until the slot is cut. I removed the excess wood with a half inch chisel. And test fitted the axle. On the front support I laid out the beveled end and set the angle of my sliding miter saw to match. It’s a shallow angle so I cut it lengthwise with a small support block helping to hold it in place. 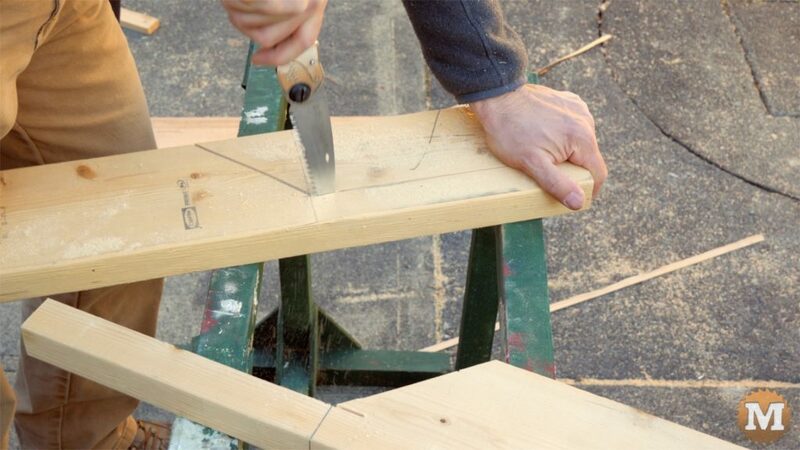 You could opt to cut this it a 45 degree angle instead if that works better for you. Once set, I cut the 4 ends of the supports. Drill a hole in the center of the axle to accept another cotter pin. 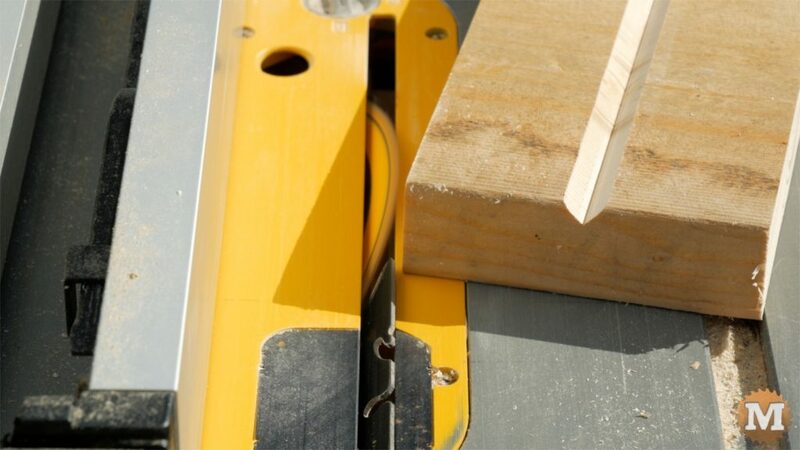 Cut a groove with the miter saw at that location. 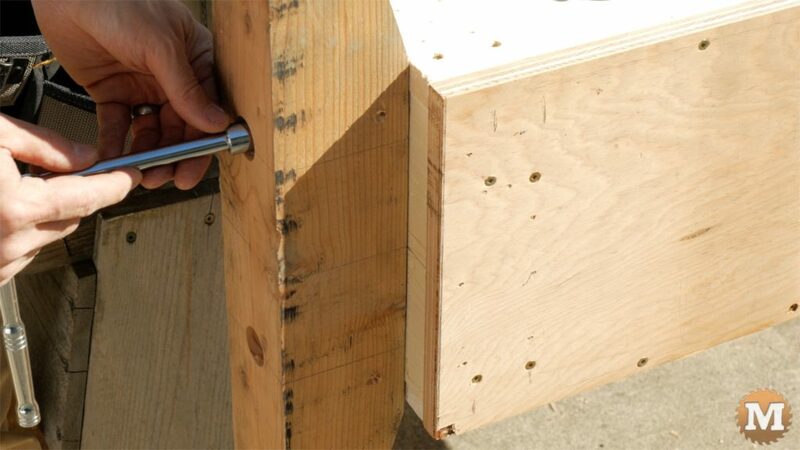 This will prevent the axle from sliding or rotating in the groove. 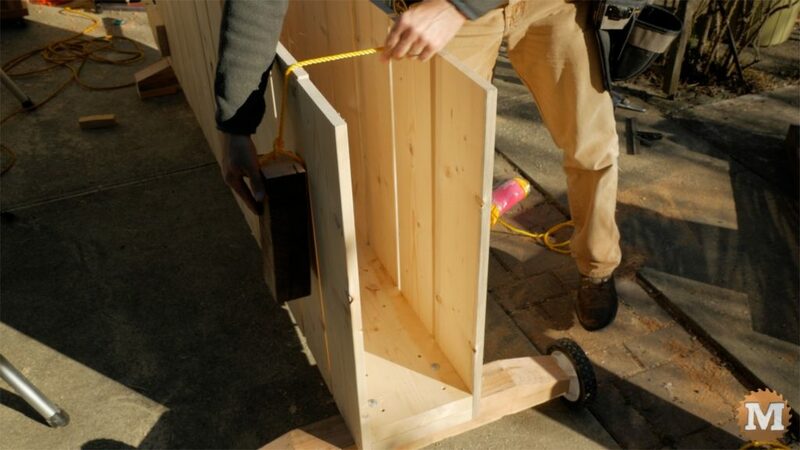 I used 6 inch long, 3/8″ galvanized carriage bolts to secure the supports to the base. I’ll use a one and a quarter inch forstner bit to allow the bolt’s washer and nut to recess into each support. 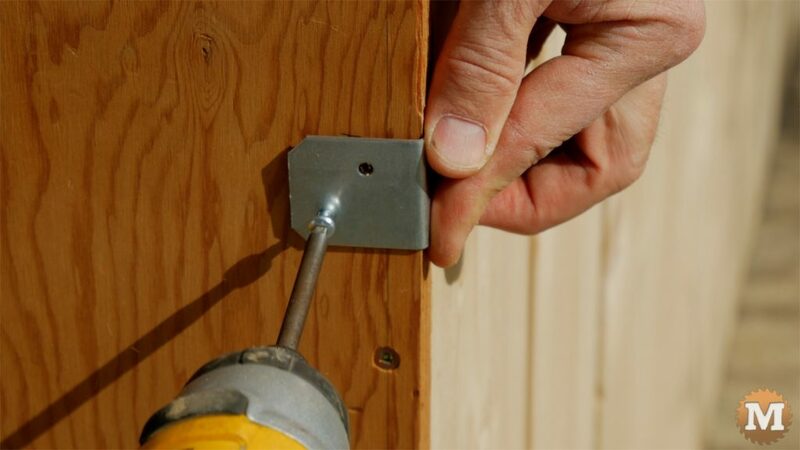 You could use longer bolts and not have to do this step. Layout the front base with the two holes marked on the center line. 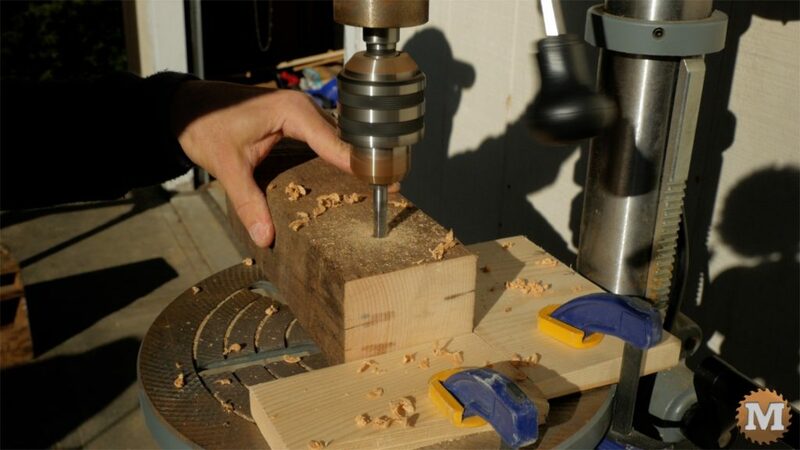 Then drill with the forstner bit one and a quarter inch deep. The same with the rear support but offset the holes on either side of the axle channel. Use the washer as a guide to layout the hole location. Chuck the 3/8″s bit in the press and drill each hole. This bit was not quite long enough in the press so I used a portable drill to finish. Set the front and rear supports aside for now to start working on the main body of the jig. 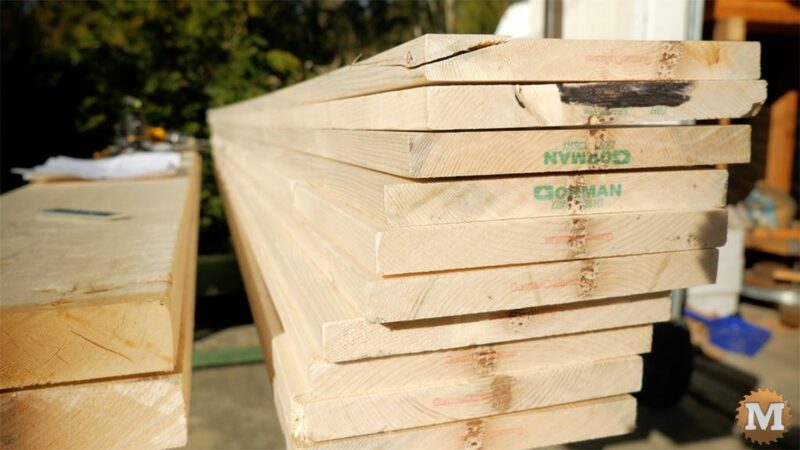 Cut the 1×8’s down to 30″ lengths. I bought a few extra in case I find a few cracks or checks in them. I used pine for this but cedar would stand up to the weather better. 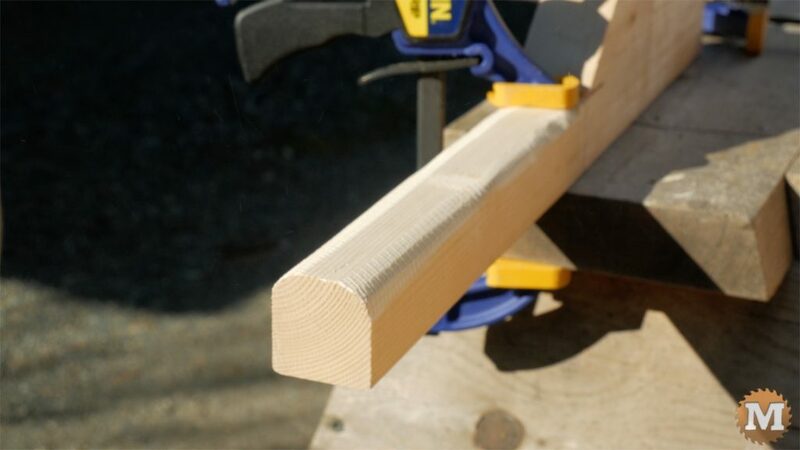 I set a stop on my saw support so I could quickly make these cuts without measuring each one. And this went pretty quick. I then took the stack of these boards over to the drill press and drilled four holes in one end. I set up a simple guide and stop block. 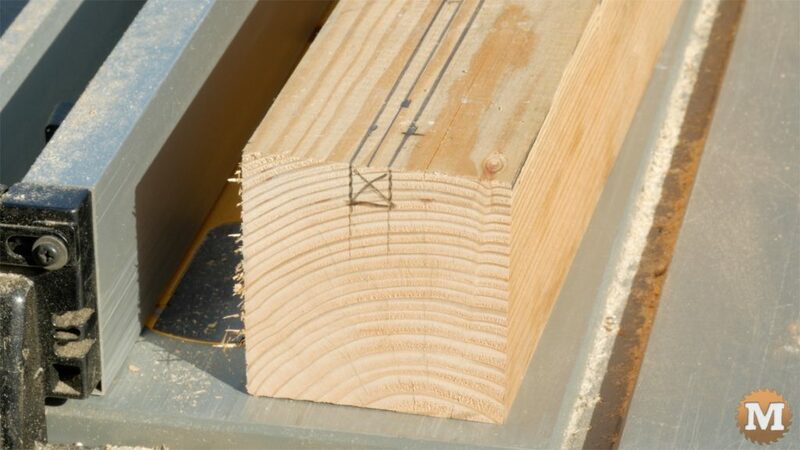 The holes are offset from the long edge 1″ and the pencil marks are 3/4 and 2 and a quarter inch from the end. This will speed up the process of screwing these boards to the base later. I cut the pair of 2×10’s for the base down to length and laid out the spacing of the side boards. I used a scrap piece of half inch plywood for one spacer, and an off-cut from a side board for the three quarter inch gap. 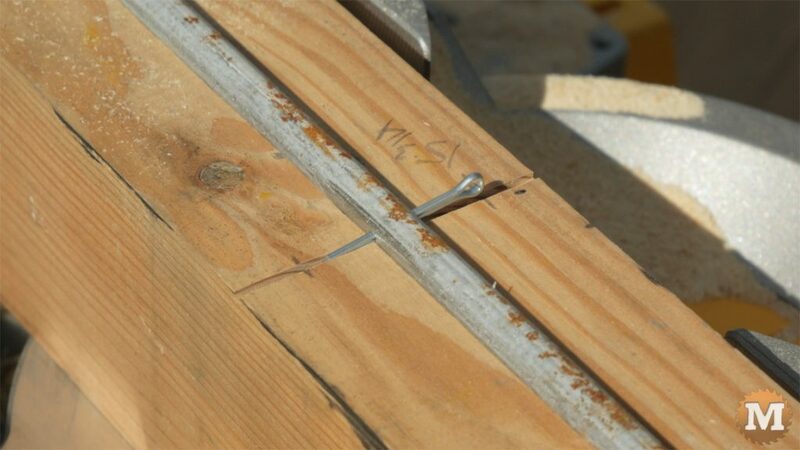 The gaps in the side boards alternate between half inch and three quarters along the length of the jig. Half inch for the rope, three quarter inch for the chainsaw blade. I drilled pilot holes in the top 2×10 to also speed up the assembly. And applied some exterior wood glue and screwed the two together. I used a few extra screws as there was a slight warp in one of the 2×10’s. Now I had lined up the edges with my speed square but there was a noticeable variation in the width between the top and bottom 2×10’s. 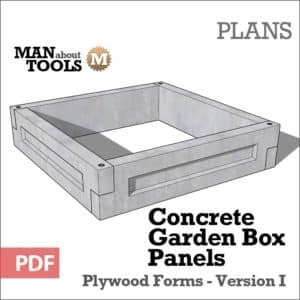 To correct this, I set the fence on my tablesaw to the smaller dimension and ran the base through the saw, flipped it end for end, then ran it again. This made the base true and square. With the base on a flat surface, I’m ready to attach the side boards. I use some glue and my finishing nailer to hold them in place, screws added later. I alternate the spacers as I go along. When I got part way done one side I started again at the other end and finished up in the middle. 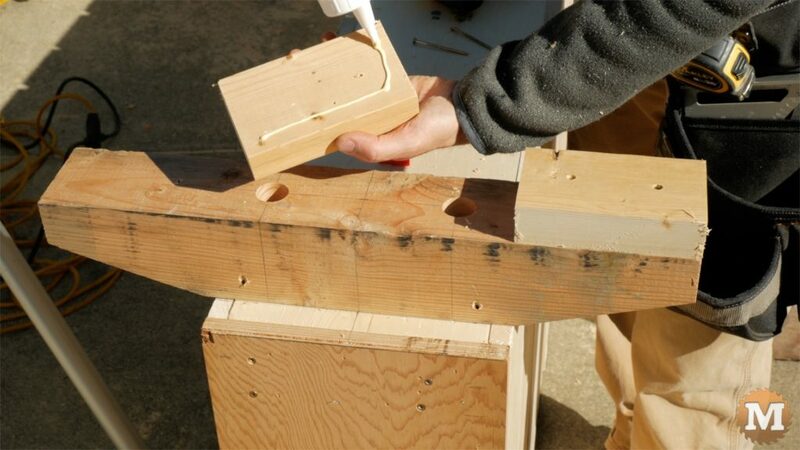 I then laid the jig over on some supports to add the screws. 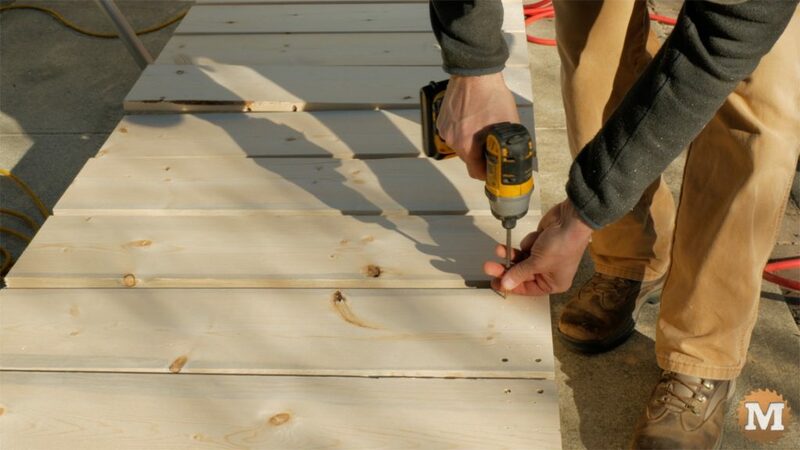 The combination of glue and screws will make for a strong and long lasting joint. Spin the jig around to repeat this process on the other side. 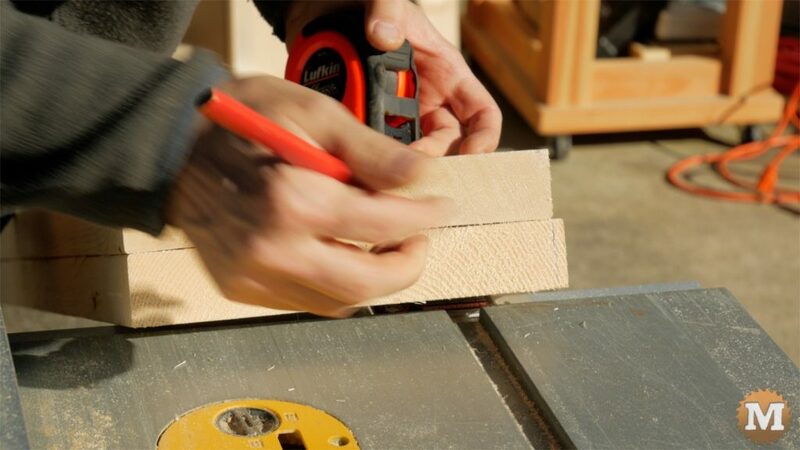 The front end of the jig is closed in with 3/4″ inch plywood. I’ll rip to width, then cut to length. Mark a line with a square 3/8’s from each edge. And mark the centers of each base. 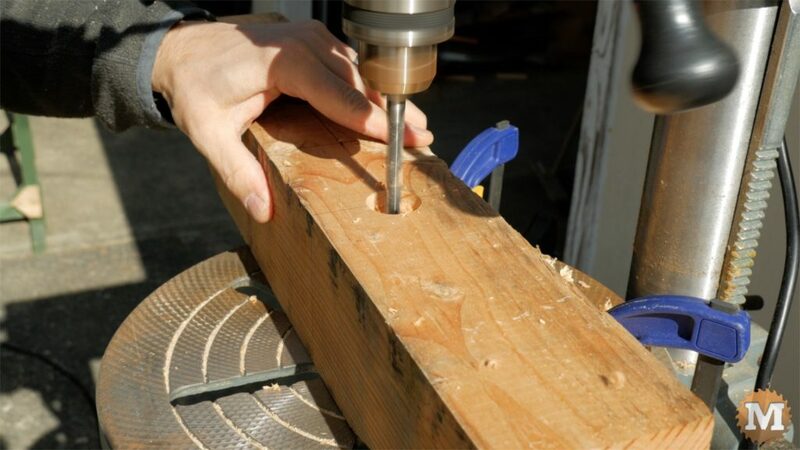 Drill pilot holes for screws. 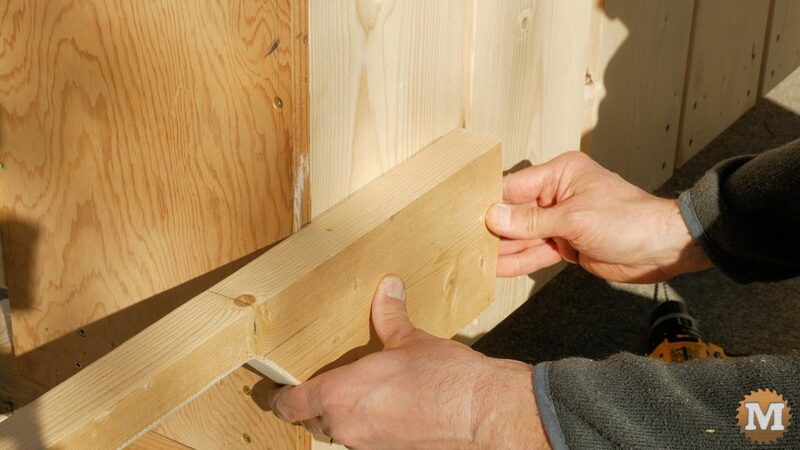 Apply some glue, then a few nails to hold it in place for the screws. 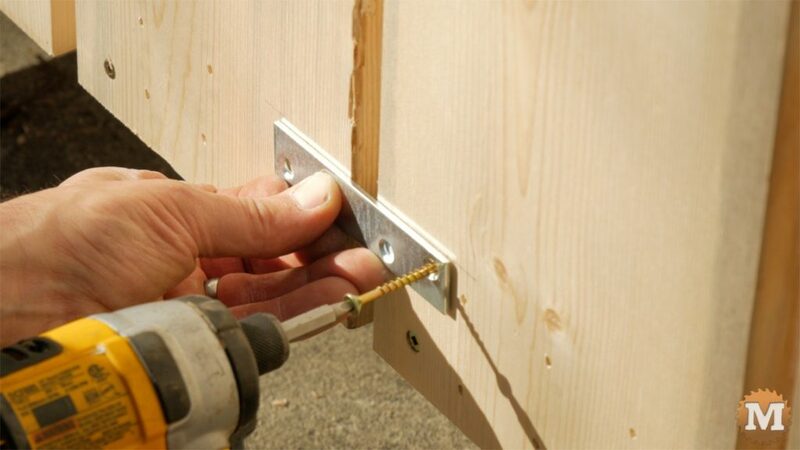 For more strength attach galvanized angle brackets to each front corner using short pan head screws. Turn the jig upside down and mark the locations for the bases on each end. 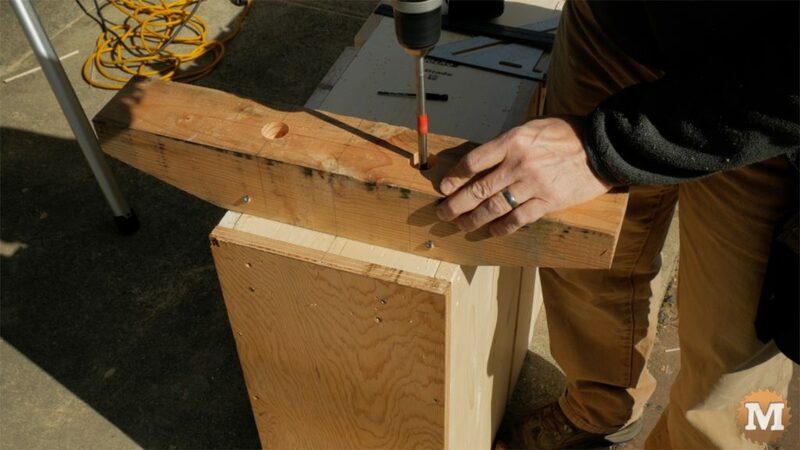 Add two screws on an angle to hold the bases in place before drilling for the carriage bolts. I then remembered that I had a long drill bit so this went quick. 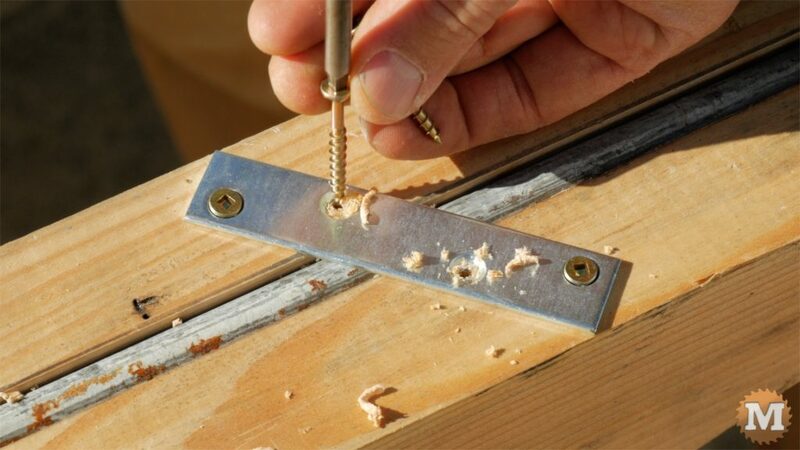 You can do this step with a shorter bit but try to get the holes lined up so the bolts will tap in easily. Repeat this process at the other end. I tapped the carriage bolts up through the inside of the jig and secured the base with a flat washer, a lock washer, and a nut. For the other end I laid the jig over on its side on saw horses to tap in the carriage bolts. The axle can now go in the groove and be secured with short mending plates. The cotter pins holding the wheels to the axle can now be bent over to keep them in place. To the front base I glued and screwed on two feet made from some scrap 2×6. This makes the jig sit closer to level. 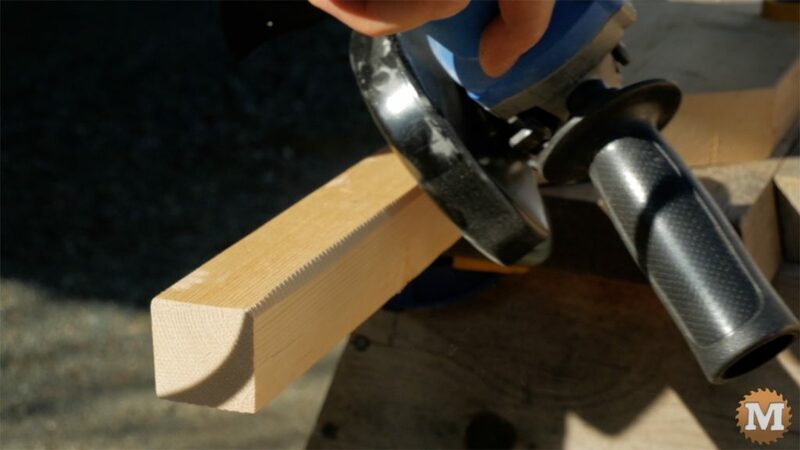 I’ll make the two handles from a 2×6. 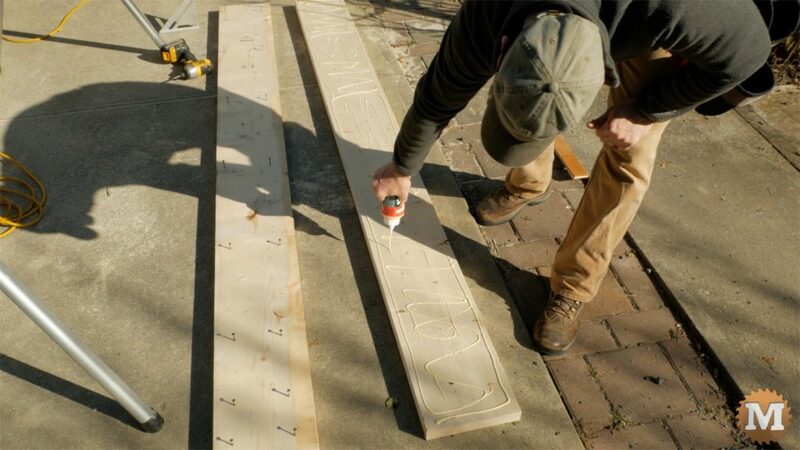 Cutting each to length first then laying out the design. 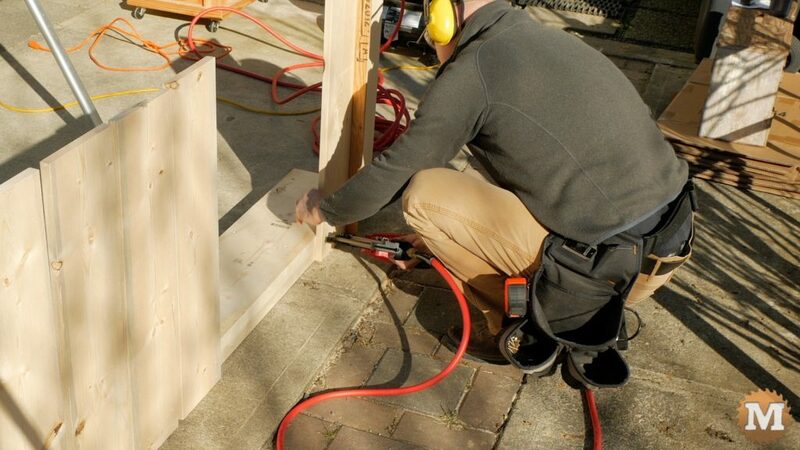 I’ll set the fence on the table saw to one and a half inch and run it part way through. Then to the miter saw to cut part of the angled section. And finish up these cuts with a hand saw. Clamp these to a saw horse and round off the hand holds. I used a coarse sanding disc on my grinder. This is all rough carpentry so just as long as it’s comfortable in the hand. With the jig now on it’s feet I can mark the location for the handles, drill the pilot holes, apply glue, and secure it with 6 screws from the inside. 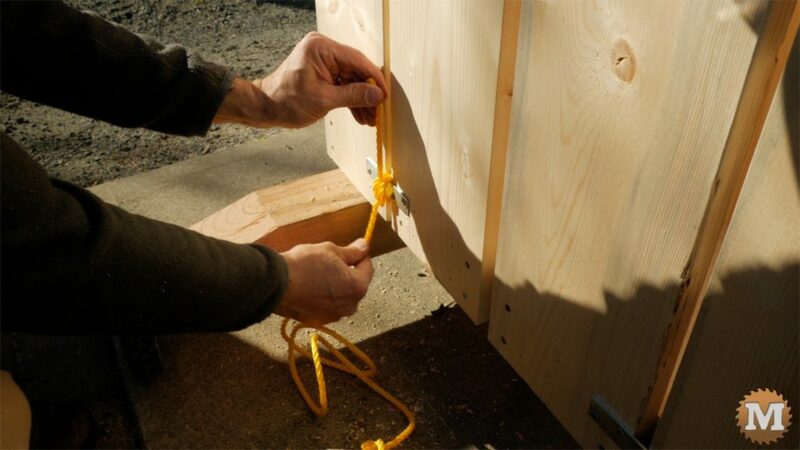 Next the mending plates that bridge the half inch gap between side boards can be screwed in place. I salvaged some wood from a few old hardwood pallets to make the weights. 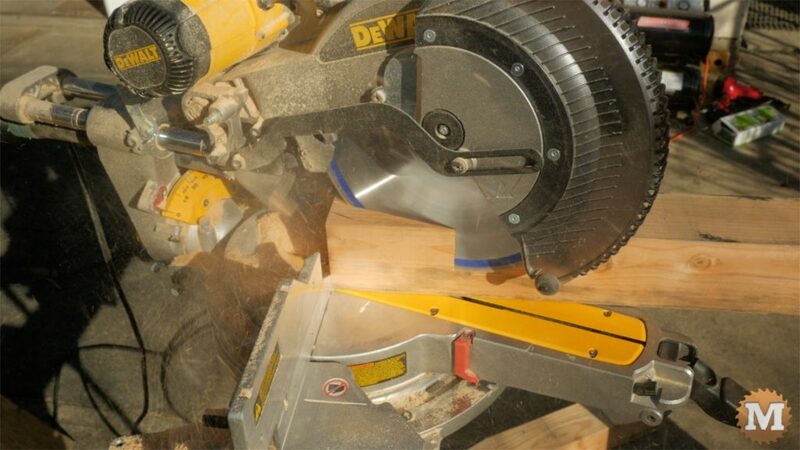 I use an older chop saw with a beat up blade anytime I’m cutting recycled wood. Just in case I hit a hidden nail. And I drilled a hole in each block. I cut 1/4″ diameter rope into 7 foot lengths and melted the ends with a lighter so they won’t unravel. I tie a block weight on one end and the other to the mending plate. 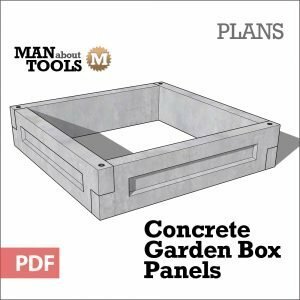 To finish off this project I chamfer or round off all sharp corners or edges with the grinder. And that’s it. The new firewood cutting jig is done.